October 30, 2009 by Michael M. Wechsler, Esq. For almost a decade, Jelsoft’s vBulletin software dominated the software market for online discussion forums. It was the quintessential example of how an enthusiastic customer base can extend a product and grow the base business exponentially. In 2007, Jelsoft and its potential was sold to Internet Brands, a public company, for an undisclosed sum and moved forward with few changes and little fanfare. In October 2009, everything changed in just two short weeks. The recent customer revolt against the new management team (the founders and most of the original team are gone) – ostensibly renamed as vBulletin Solutions (“vBS”) – is an interesting, ongoing case study that companies changing their software licensing models may want to follow. In the interest of full disclosure, I am a current owner of vBulletin software, managing a long running legal advice & assistance forum since the earliest versions appeared in 2001. My comments below represent my good faith understanding of the confusing events of the past two weeks and subject to correction. Due to an overwhelming response and interest in the pre-sale event for vBulletin 4.0 Publishing Suite, we’ve decided to extend an offer to those customers with inactive licenses. For licenses that expired in the last 12 months, we are offering an extra $45 discount for advance ordering, in addition to the publicly available pre-sale savings. This means the all new vB 4.0 Publishing Suite will cost you only $190, a total savings of $95. For licenses that expired more than 12 month ago, we are offering an extra $25 discount for advance ordering, in addition to the publicly available pre-sale savings. This means the all new vB 4.0 Publishing Suite will cost you only $210, a total savings of $75. Actually, the system was written so that it doesn’t make any differentiation between active or inactive licenses. Why we don’t know. You can sure it will be changed before the next big promotion though. This is certainly not what is expected from the marketing department of a public company. I appreciated the rare, honest reply but let’s have more transparency. Considering that Internet Brands and vBS promised vehemently that subsequent promotions will never be as generous as the current pre-sale, I wonder whether the apologies will be forgiven by customers. Even more interesting is that contract and consumer law suggest that a unilateral and non-obvious mistake in an offer is binding on the offeror – I wonder if this would make for an actionable case by customers with active licenses but expired maintenance subscriptions. All of these issues could have been dealt with appropriately had vBS provided some prior notice to customers about imminent and important license changes. Management could have responded to and addressed important and overlooked customer concerns. In addition to a feeling of disrespect, customers were not provided with ample time to understand their options and make reasonable choices. For those who invested in multiple licenses, the huge cost of having to shell out $130 to 210 per license within two short weeks could present significant financial challenges. Notification to clients of these policy changes would be extremely difficult and require a lightning quick response for an explanation, approval and payment. Did anyone at Internet Brands solicit opinions from customers and address what would seem to be obvious customer concerns? Why the need for a high pressure two week pre-sale? Where was the dialogue? But more than just an inconvenience to customers, not having knowledge of the new policies would result in customers losing actual money which would find its way into the pockets of vBS and Internet Brands, as you’ll see shortly. The world of php development with visible, modifiable source code is an interesting, unique, creative community environment. Jelsoft grew exponentially because the founders and original employees, many of whom are unfortunately no longer with the company, understood the quid pro quo — provide a good product at a reasonable cost, care about your customers and you will generate enthusiasm and loyalty from a creative group of zealous adopters who will volunteer enhancements on their own time. It was commonplace to see customers donating free technical support and valuable vBulletin product enhancements for free, significantly increasing the value of the underlying forum product. In general, annual maintenance fees and software updates will rarely extend beyond the 50-70% cost of the purchase price. Customers feel that they should have retain some tangible residual benefit as a product adopter and investor. This sentiment is probably more prevalent amongst a customer base consisting of a contributing, programming, developing online community. I am not sure that the new management team at Internet Brands that replaced most of the founding team fully understands and appreciates why Jelsoft grew into the juggernaut it has been and how to properly maintain the symbiotic relationship. An offer for a $130 upgrade or $285 new is not by itself an unfair price – I think it could be – but the timing required to pay and lack of equally fair treatment to customers across the board is a significant problem (e.g. the additional penalties to licensees with expired licenses and those wishing a bare forum upgrade.) But the two week pricing ultimatum and significant reduction of the value of purchased software licenses seemed to send one message to the loyal development community – there is not much perceived value in your being a patron and contributor and that we, the company, are in sole control of our own destiny. From my deciphering of the terms (please correct me if this is wrong), forum owners were left with two choices: (i) pay a forum upgrade fee of $175 that is an astounding 90% of the cost of buying a new forum license outright ($195), or (b) within two weeks and without seeing the product or having an estimated release date, pay from $130 up to $210 based upon whether your annual maintenance subscription was active. If it wasn’t active and you didn’t know you should have renewed for $40 (how could you? ), the “special offer” meant that you’d pay $5 less or $15 more than the price of buying a brand new forum! As a result of the Internet Brands pricing plan, the value of a customer’s vBulletin forum license version 3 plunged instantly from $180 to practically nothing. After all, who would pay much for a $180 license that now cost $175 just to upgrade if a new license cost just $195? $5 to save $15? The same went for the $250 upgrade fee post pre-sale, which is just $35 less than the $285 asking price. So what is the net result and why is this important? Because by making the customers $180 license worth almost nothing on the resale market, all sales by new customers will be new licenses purchased directly from Internet Brands. This might explain how Internet Brands is “setting sales records” in their press releases! It was even worse for customers who purchased vBulletin 3 forum add-on products (such as blogs and project tools) from vBS, who apparently lost their $50+ investments, being entitled only to the same upgrade options to the vBulletin suite as a customer who purchased only the forum product. Customers who wanted or needed to just stay with version 3.x and continue receiving the upgrades are offered no $40 option at all of which I am aware – the only choice is to pay $175 – $210 to be forced to upgrade to the pre-sold but still unreleased version 4. It seems unconscionable to not inform a customer who bought version 3.x before the pre-sale of a need to pay an annual maintenance subscription for $40 or continue to offer this option. Numerous requests in the vBulletin forum to define actual company policy went unanswered. In the forums, customers alleged consumer fraud – that the $310 price paid by customers occurred because vBS was selling product under old licensing terms when it knew that the sudden change to the new model would require an additional $130 investment. In my experience and to promote fairness, it is industry custom for software developers to provide free upgrades for license purchases made in close proximity to a release of a major upgrade – a grace period. To my knowledge vBS provided no such benefit. As a result, a customer who purchased vBulletin 3 in late Semptember for $180 would need to pay an additional $130 in the October pre-sale in order to be guaranteed receipt of all vBulletin 4 updates. $180 + $130 = $310. With reasonable prior notice, that same customer might have waited a week to pay just $235 for a new license. Customers with expired annual maintenance subscriptions had expired could pay $40 and avoid newly created vBS penalties of an additional $20 – 80 for the upgrade. I personally don’t see the cost “savings” – do you? We know everyone is anxious to see vB4 in action, so here it comes! We are planning to upgrade vBulletin.com to vB4 starting very early tomorrow morning. The plan is to put /forums/ into maintenance mode in the middle of the night (Pacific time) and be live again by mid-morning. Please note that this rollout will be an early beta release. By early, I mean really early, much earlier than betas have historically been rolled out on vb.com. It is not a release candidate, so there will be rough spots, which we’re still working on, but we are choosing to make this available now in order to give you the earliest possible view of what is being built. Why didn’t you wait until the product was more “done”? To give you the earliest possible view of the new vB4. Why didn’t you wait until the CMS could be released along with Forum and Blog? Why aren’t you delaying the release until feature _____ is implemented? In the spirit of release early, release often, we want to get releases out to customers early, in order to get real-world feedback, and often, so that they can start benefiting from basic features as soon as they are available, with more advanced features following shortly after in subsequent releases. We decided to take some extra time before bringing the forums back up after the upgrade to 4.0. Briefly, here’s what happened. First, the good news: The installation of 4.0 itself actually went as planned. The upgrade to 4.0 Publishing Suite from the 3.8.4 base product was seamless, and that agrees with the success the alpha/beta team has seen up to this point. The issues we encountered were related to the fact that the instance of vB running on vBulletin.com has integration points with various business systems: administration, release management, ticket support, the product information site, and more. Cooler heads make better problem solvers, so we chose to investigate and solve the problems with the site offline rather than live to the world. The issues we ran into are unique to our environment, and they are not things that would factor into a normal customer installation. We’re happy to have the forums live and stable. As noted in my announcement Wednesday night, this is a very early beta release, so there are still known bugs yet to be fixed before the gold. As you find bugs, you may report them here as usual. As we work through the beta cycle, we will periodically update this installation to include the latest bug fixes. Got it – so this wise decision made during a limited pre-sale period included extended downtime because the cool, sharp heads thought it would be wise to show off the forums on their own live customer support forum and not on a testing site. They also provided no view of the back end administration or any of the extras included in the suite. I won’t elaborate on the extended confusion in the vBulletin customer support forums and allegations by customers that they were banned for criticizing the company’s handling of this entire upgrade experience. Conclusions – So Where do we and vBS go from here? It seems to me that many customers who chose to upgrade did so not because they had any faith in the upcoming product – they hoped to save the fleeting value of their investment in their vBulletin forum licenses by reselling the suite version later when the price rises to full retail. I wonder whether the flow of free forum modifications may slow to a trickle by angry contributing developers who feel unappreciated. I’ve been forced to look at several competing forum software packages, all of which are quite impressive – these include the commercial Invision Power Board Forum Suite and the free myBB, phpBB and Simple Machines Forums software. Customers have been vocal about their migration away from vBulletin – angry sites like vbTruth, vbFlames, vBull, and if names are correct, it seems this may have compelled vBS General Manager Ray Morgan to provide explanations on an external site, AdminAddict. New customers may question whether to trust this new Internet Brands management team, who are not providing any reasonable estimates as to time periods for major version upgrades. During times of limited cash flow, will these paid number “version upgrades” arrive with greater frequency? It’s difficult to say. The old guard was beyond reproach. This new executive management team seems to be as confident as ever, believing that their power of market share will ultimately outlast any initial negative customer dissension. The licensees will whine and complain but, in the end, they will begrudgingly crawl back and pay the upgrade fees for the best forum software… ever. And they will donate their modifications for free en masse. This remains to be seen, especially during the present “global recession.” What we can say for sure is that this is certainly a good case study to follow, from a business and legal perspective, for companies seeking to change their software licensing models. Nice writeup, I was a little upset at first but then I started thinking about it. 130-200$ to me isn’t much considering everything vBulletin does for my site. It’s getting a bit old seeing everyone hashing out the same story of how iNet is crashing vBulletin. It will all pass and no one will even remember all this. I agree they haven’t handled themselves in the best way, but we should let the software speak for itself. I’m not limiting myself to vBulletin, I also have an IPB license and have used phpbb in the pass. Everyone should check out all their options, but complaining isn’t going to help anything IMHO. Brandon – thanks for your comment. It’s interesting to hear a reader’s take on the article. I actually agree with you completely that $130 – 200 is certainly a reasonable upgrade price if vBulletin 4 suite is released, stable and as promised. Perhaps this isn’t clear from the article (which I’ll try to address) although there are pricing issues: (1) not every customer in this equation being treated with equal fairness and that is the pricing problem, not the ultimate price of $285, and (2) the lack of any justification for an unannounced two week window to come up with the money. Why not a month? How about a 2 week period after a 2 week notice? What’s the problem? Is the current management team not confident enough in the product itself that it needed to use a pressure sales tactic to convince customers to upgrade? (3) What is the road map for product release? $285 for everything vBS proposes to offer is a fair price but at approximately what date will I see a return on investment? I don’t think it’s fair to ask for money if you can’t answer the reasonable, expected questions. Good points and I’ll try to refine slightly to make those parts clear. You missed out vBull.net. I personally prefer it as it provides a slightly more down to earth style commentary, while some of the other sites seem a bit more “ranty”. Otherwise, excellent article – I really do agree that it will be interesting to see what happens to the community and community developers. I’ve made this point before, but, it really could be a case that they’ve shot themselves in the foot without realising it at this stage. Brandon — let’s not try to redirect the primary issue, which is prior notification to customers of the Presale. More so, paying or investing (depending on your spin) in a sight-unseen-tested product. What are the legal tenets for pay before you buy? Is it governed by such clauses of “Notice of Intent”? Is it just a pure faith issue? I think not considering contractual agreements, but I’m not versed in such nomenclature and practice. Ergo, I appreciate that a person of the legal theme has chimed in. Moreover, your article is the most articulate and comprehensive that I have come across. For the most part, people should have just said N-O and not upgraded. Wait for the real release of vb5. But this is besides the point of business communication, just an option to take a stand against such BS. Alasdair – thanks for note about vbull – yes, I enjoyed reading the material on their site for the same reason! And yes, perhaps the foot might require much more healing before it can take significant steps forward! Great article Michael – the best I’ve seen so far – so great job and great read. One aspect of these changes, that I can only describe as a “debacle”, that I was hoping you would have expanded more on, is with regard to the issue of the current blog license holders. I’m not sure if you’re aware, but previously, the blog software was sold to customers with lifetime licenses, that were supposed to be valid as long as customers kept active forum licenses. But now under the new license agreement and promotion, blog owners are being told that they will have to upgrade to the “Suite” software in order to continue using the blog software. 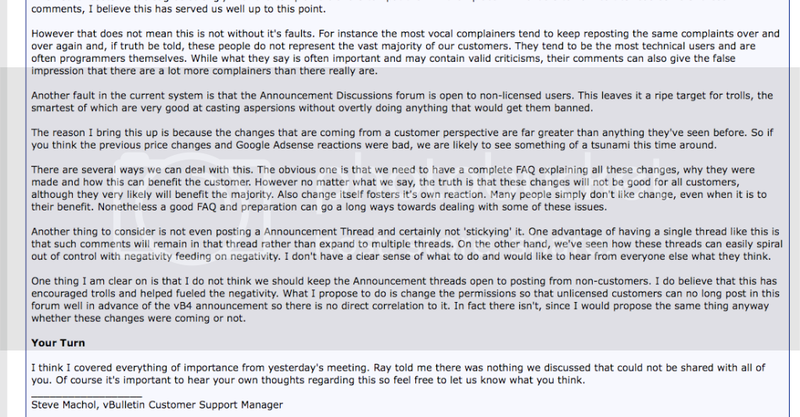 Apparantly, blog owners updating their forum license only is not good enough for IB. But this in effect has left many blog owners feeling and arguing, that this requirement, in essence is forcing current blog owners to pay for the blog software for a second time. And questions and complaints on vBulletin’s support forums related to this issue have seemingly been ignored by vBulletin to date. Given that, I was hoping you would have expanded more on this specific issue and was hoping to hear any legal opinion you might have, if any. Gordie – thanks for sharing your comment and the information about the vBulletin blogs. I completely agree with you and sympathize with your plight. This “debacle” as you call it, makes it difficult to highlight so many areas where customers understandably would feel slighted. I summarized the frustration by saying blog customers are being given the same upgrade deal as customers who didn’t make an equivalent investment, and that’s really the point – the pricing is not justified given the significantly unequal treatment of customers. It had to be short because the article had reached over 2,000 words and there were critical points to hit that affected a majority of users! Regarding legal opinion, I am unaware of the license terms but glad to review if you send them to me. My feeling is that you still have a lifetime license to use them, but it’s with vb 3. I’m not sure if pricing of the blogs is a legal issue and more a matter of policy that you may find unacceptable, leaving the customer with a choice of whether to stay with the product and management or write off your losses and move elsewhere. Let me know if I can help. Contrary to the requirement of good faith it causes a significant imbalance in the parties’ rights and obligations under the contract, to the detriment of consumers. ‘Good faith’ means that you must deal fairly and openly with consumers. Standard terms may be drafted to protect commercial needs but must also take account of the interests and rights of consumers by going no further than is necessary to protect those legitimate commercial interests. And remember, vb3 is under the UK jurisdiction, where vb4 has been changed to the US. Best write-up I’ve seen to date, great work Mike. I must say you did a fantastic job of summing up all the facts and issues concerning the up coming vBulletin 4 and the pre-sale event without putting a whiney, arrogant, or one-sided spin on things. Excellent article. One thing that was not highlighted is how recent new customers really got the shaft – spending hundreds of dollars for new licenses only to find out that just a few weeks later those licenses were worthless and they would have to pay again to get product updates. When asked about this in the forums – the official response from vbulletin staff was that there would be no consideration for such cases. It certainly did not pay to put your confidence – or money – into Vbulletin products in 2009. Well, the “theft” bit anyway. I was in a very similar situation… 2 years prepaid of which I had 1 year and nearly 11 months left; but IB literally stole those 11 months from me and credited me only for the full prepaid year. I can only guess how many hundreds of thousands this little scam has brought them overnight. Unbelievable that no one has challenged it in court yet. If that’s not stealing, what is? Great article and thanks for taking the time to put it together. I am still baffled however at people look on the suite being a good deal. I purchased my license 5 years ago, have paid my renewal fee every year and i purchased the blog program. This year i paid my renewal fee, and went to visit vbulletin.org where i found a leaked information post, which explained the costs, the views of customers by IB, etc. Being shocked, i went to vbulletin.com to see if this was true. I found out that the information contained in the leaked information was word for word, truth. I became angry too when i found out while reading this information, that i will no longer receive blog updates, unless i purchase the suite. I have trouble believing that this is even legal. I paid $50.00 bucks for this piece of software, and don’t feel like paying for additional software i don’t need that are in this so called suite, project tools and their cms. I have a great cms program and have enjoyed using it since the day i opened my website. I am sad that IB and it’s team have decided to treat customers how they are and i sure hope that this bites back at them, forcing the company into bankruptcy. Aaron – check out the last paragraph of Part II – Justification of Pricing. It talks about the lack of any grace period, inherently suggesting a strong whiff of fraud and contrary to basic common sense. Complaints like yours allege that vBS was selling today the old license that it knew it would change tomorrow but didn’t share that information with the consumer. I hope to be discussing this with several consumer law and class action attorneys over the next few days to get a better grasp of what this might mean, including with regard to state and international laws. With regard to court action, these things take time and research – nobody just files a lawsuit the following day. The strongest potential case IMHO? The fact that vBS was allegedly selling new license knowing that it was going to switch the terms on the customer imminently. What is possibly not coincidental is the press release that was released on the final day of the presale reporting record sales numbers. Hotwheels – my sympathies and, as you can see, you are far from alone. It shocked me that, from my reading in the vBulletin forums, that more information was being gleaned from replies by customers than it was from official announcements and statements by Internet Brands. You are far from the only one who doesn’t need the “vBulletin suite.” With regard to the discontinuance of the blog, look at the license and step back for a minute – I don’t think that a company is required to support and update a product forever. Rolling the blog into a suite offering is not necessarily a bad thing either, especially if it can give you additional products for only the cost of upgrading the forum and blog to the next major version. What is problematic to me is that all users who bought the standard forum are now required to pay 90% of the cost of a new forum just to upgrade the forum!!! If Internet Brands wants to talk about setting new records, that’s a dubious one if it qualifies. This means that, like yourself, it seems to me completely impractical to upgrade a forum to vBulletin 4 and it’s just as simple, if not much cheaper, to just migrate to another product. You’re going to have to do it anyway with vBulletin 4. Invision Power Board has a special $125 discount offer to vBulletin refugees that is an astounding 29% less than vBulletin 4 forum upgrade – and you also have a working product you can develop! The migration of the forums at vBulletin.com to vB4 beta 1 (which led to 27 hours of downtime, and then many hours of extremely congested forum performance when the site finally came back up) was very likely related to the leak of vB4. vB4 was found to be running at a public website and many users signed up, tested it out, and took screen snapshots. Also, realize that the new license information was leaked this summer when the vB forums Admin section was unlocked to the public for 13 minutes. We were assured that it was just a discussion and that we could expect changes in the final version. However everything from those leaked documents, including predictions about just how angry the vBulletin community would be, came to fruition. Morgan – Thanks for the comment. I don’t think anyone knows for sure why the vBulletin customer forums were migrated to vBulletin 4. The public website that ran the early beta was taken down quickly. Even being up, it still doesn’t explain why anyone – least of all a company that is supposedly a pure Internet play – would use a “almost-beta” on a live site. Incredibly hard to believe. The leak of the license information and the statement that the folks at Internet Brands knew about the potential backlash makes the situation worse. It’s clear that Internet Brands defines the word “hubris” and we’ll have to see how this controversial upgrade and blatant disregard for customer concerns affects the company going forward. The real question is “so what are the customers going to do about it?” Additionally, will new users care? It would seem that they should. I am not sure about the license information. What i am sure of is i purchased 2 diffent pieces of software from this company, which had different expiration dates. Without notice, they merged my two software licenses into one, forcing me to loose almost 6 months worth of upgraded time. Feldon, i am so glad you stopped in here too, you are right, the leaked information that they denied, is happening word for word. I wish more people would read the leaked info and then ask the hard questions at vbulletin.com. Even though they will be banned for doing so, we as customers should have the right to know. I know this is a bit off topic, but how come internet brands CEO isn’t noticing all of this hate and discontent? Is he that blind to what is happening? How can he not take a look at his current management team and think about a change? Maybe he should take a few minutes and look into steve machol’s banning history, i think he would be shocked to see how many people steve machol has banned just over the last few months. It would not have been so bad if the $130 offer was available up until the date that an existing contract ends. Mine does not end until almost 12 months – why should I pay $130 now. If I could renew for the next 10 months or so, then I would have had no complaints – IB would have got their money and they would have had one less unhappy customer. Sadly we have little choice in the matter – pay up or close down our site – we have had to chose the later option. Hotwheels – I don’t know why the Internet Brands CEO isn’t noticing the problem and I am rather sure he’s busy with the numerous other items on his agenda and not reading forums and general Internet blogs. He probably gets his information from those that report to him. Take a look at this interview with Ray Morgan, General Manager at vBulletin. He is quoted as saying “We disagree that reaction has been bad. We’ve experienced record software sales since vBulletin 4.0 went on sale, demonstrating an overwhelmingly positive response.” It’s quite clear that even he believes completely that he can sell this nonsense and pull the wool over the eyes of everyone with the barrage of press releases proclaiming record setting victories. The fact is that he used a two week pressure sale into scaring customers that if they don’t upgrade immediately, they will pay a much higher price later. This is denial. It’s also clear that he believes that the complainers are vocal, but few and far between meaning the company “…doesn’t believe a small but vocal minority should be taken to represent the entire vBulletin community of tens of thousands of customers.” The customers will have to show them they mean business with their wallets and perhaps more. Gentle Giant – sorry to hear about your site. With the successive press releases issued by Internet Brands, it’s clear that this division was interested in one thing – a desire (or need?) to get as much cash as quickly as possible. I think there are choices for your site – either continue using vBulletin 3 indefinitely (if you have an owned license) or move to a competing product. I don’t think that vBulletin 4 will be ready to compete with its predecessor for a long time. And moreso, will mod developers learn from Internet Brands’ lead? Perhaps they will choose not to leave any money on the table and donate their mods, if they even choose to develop for vBulletin 4 at all. Try an alternative. We are using Invision Power Board and have also used phpbb successfully. Well it appears that team vb.com has stooped to a new low. Brandon Sheley whom runs a site that is built around vbulletin, received a dmca complaint today for sharing Bob Brisco’s public blog “vision for vbulletin” on his site. I am having trouble believing how unprofessional this entire thing is getting. Sending out a DMCA complaint because someone posted what you said word for word, is bullcrap. Brandon has done allot to help with the growth of the vbulletin community, and is now threatened by the company he faithfully seemed to believe in. Is it really legal to even file a DMCA complaint for coping and pasting something that is public on the internet? And to the follow up posters, don’t misunderstand – Bob Brisco isn’t his spending time drafting notices. This is a command decision where it appears that Internet Brands has decided to send a message to vBulletin licensees – by wielding a massive hammer – that it will come after licensees like gangbusters if you cross their line even for harmless actions. Honestly – I’m feeling somewhat uneasy about what repercussions I might face and voicing my own opinion about their actions – I still use vBulletin. This all makes me wonder whether Internet Brands is tracking every vBulletin forum owner’s site, both for negative publicity as well as scavenging for vBulletin sites to buy at bargain prices, which seems to be what their company does. They do require owners list the site URL installed and tracking is a less further stretch to the imagination than finding Brandon’s notice and sending a DMCA takedown letter. I’m not sure what to make of all this. PS – Brandon – I wonder how you feel about your earlier comments here now that vBulletin apparently sent you a takedown notice! PPS – The plot thickens – Bob Brisco claims the DMCA Takedown Notice is a hoax as does an announcement on vbulletin. Why would anyone do such a thing? Could this be another marketing ploy? I see a few people replied directly to me, and I’ll try to address your questions. There seems to be some anger with the pre-sale before a release is around. I fully understand that and can somewhat agree with you but.. I’ve been a fan of vBulletin for years and have always been happy with their product. I had and still have no doubt that I’ll like 4.0. That is why I picked up the sale and saved almost 50% of what it would cost if I would of waited. •	misleading practices (includes both acts and omissions). One of the key tests in the Regulations is whether the commercial practice in question materially distorts the consumer’s economic behaviour (e.g. was the consumer persuaded to make a purchase they would not otherwise have made because of the commercial practice?). A breach of the Regulations is, in most cases, a criminal offence. I have an active 3.8.x owned license plus blog. I was given a lifetime ban from vBulletin.com for voicing my protestations over the licensing change. Are there any legal challenges pending? I notice to upgrade to 3.8.5 (a maintenance release) I have to sign a new licensing agreement. The license was originally governed by the laws of England & Wales. The new license transfers this to California. I haven’t accepted this agreement yet. If I use vB4 I cant use the blog I bought. It also appears to be very “buggy”. So I’m planning on sticking with vB3. I’m still angry that IB treated loyal vBulletin customers so badly. I’d love to see this challenged in court. I think that if vBulletin had done well there would have been legal challenges. The fact is, and I think the opinion is unanimous, that vBulletin 4 has unfortunately been a tremendous failure as many have predicted. While the presale produced “record numbers” as reported by Internet Brands, it was accomplished by forced pressure sale on its customers. The “pre-sale” resulted in a “pre-mature” release and the style system is so plagued with problems that virtually every major theme designer is not developing themes for vBulletin – even at this late date more than 6 months later after release. I run a large legal forum using vBulletin. If it weren’t for Google rankings and backlinks, I might have considered moving everything I have to Invision Power Board a while ago. It’s a great piece of software and does much of what I hoped vBulletin would have done instead of what they are doing now. Times are interesting… we’ll see. Thanks to The Law Professor for creating a permanent record of what vBulletin have been up to. I think it is important that people understand a bit more about the tactics of the organisation now behind the vBulletin product. The update is still available, but only when you buy another product! I saw a comment on the vBulletin.com forum recently from another customer who likened this to Microsoft saying “if you want the latest service pack for Windows XP you will have to buy Windows 7”, (not that Microsoft would ever be so stupid to try a stunt like that). To my mind this is either coercion or blackmail, take your pick. Is this type of commercial behaviour not illegal in some jurisdictions? And if it is, does a US based company have to abide by local consumer laws when it sells a product into another jurisdiction?